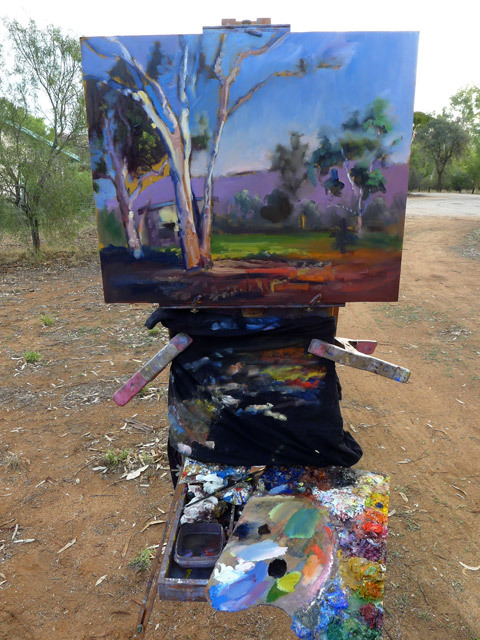 Temperatures in Central Australia are starting to increase heralding the hotter months ahead and reminding us to be active outside with our art before it gets too hot to do so. 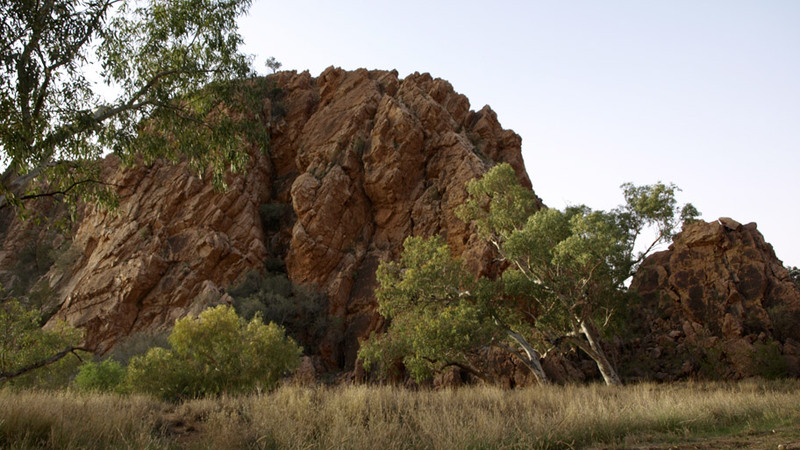 On that note, please try to make our final En Plein Air event to be held at Simpsons Gap/Cassia Hill on Sunday 21 September. It will be great to see a big turnout for this one given it tends to mark the end of our outdoor activities for the year. Go to: https://caasinc.files.wordpress.com/2014/04/caas2014enpleinairprog.pdf for more details. 701 people voted for the People’s Choice and approximately 700 visitors viewed the exhibition over the two weeks. Life Drawing activities at the Art Shed continue to be popular and committee member Mark Wilson does a great job of organising models. For details contact: lifedrawingCAAS@iinet.net.au or phone Mark on 0428 478 143. (Send an sms if you prefer) To receive notice of the Saturday afternoon sessions send us your email address. The Wednesday evening Long Pose group works strictly by SMS to a mobile phone to give a quicker turnaround time. Non-members welcome but there is an extra $5 charge. Our Secretary Nyssa Mullooly recently stood down from the committee and moved to Brisbane. I’d like to acknowledge the splendid work that Nyssa did during her time on the committee and wish her and her partner Chris every success for the future. In the meantime, the committee is working hard organising various other activities coming your way soon. 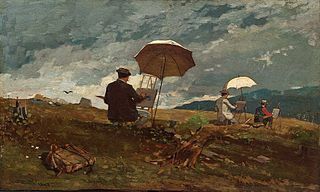 Please keep in touch https://caasinc.wordpress.com/ – members and friends are always welcome at the Art Shed and to any of our activities. 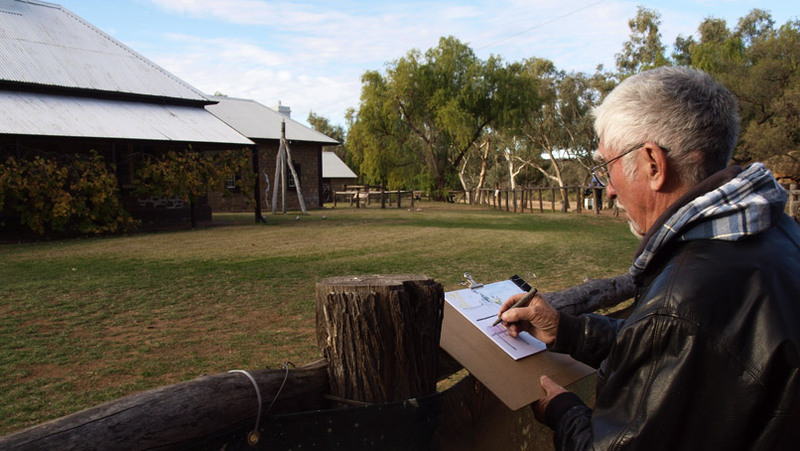 Our 2014 En Plein Air season kicks off this Sunday 3PM at the Telegraph Station. Meet on the river bank behind the main building. If you are running late look for us scattered about! Bring your art materials as you need. Please consider that the social aspects are as (if not more) important as the artistic endeavour! Do as much, or as little art as you desire! Consider bringing a vino and BBQ grub to enjoy with your snacks that can be as simple or elaborate as you so wish. These we normally share after a time of drawing/painting .. whatever. Remember a hat, water and a stool. 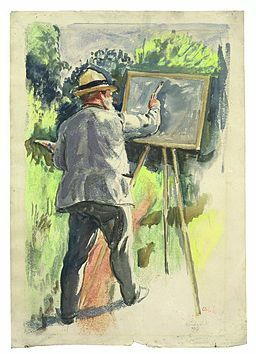 Contact a committee member if you wish to borrow an easel. 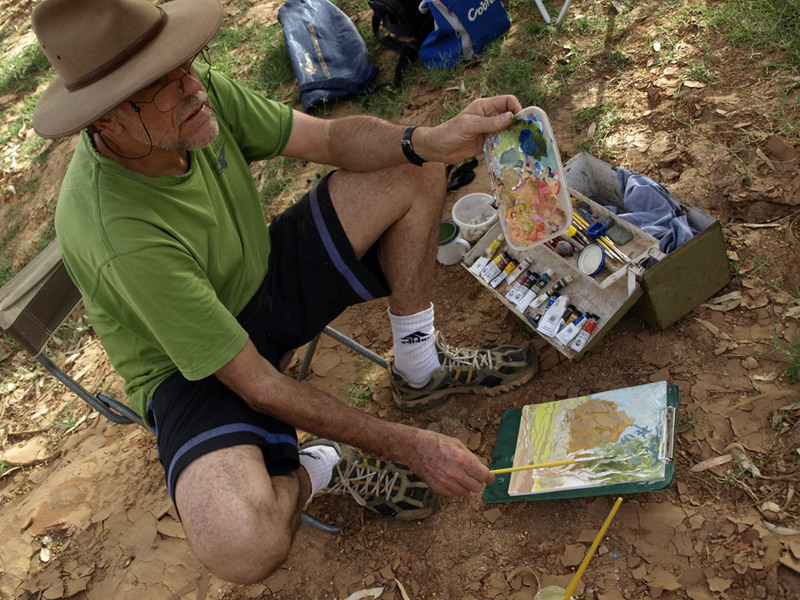 Season Program details are under the ‘Plein Air’ TAB at the top, below the banner. With the cooler weather arriving it’s time to move our art outdoors again! Our first meeting kicks off at the Telegraph Station on Sunday 18th May at 3PM. Scott Bennett’s painting of the Macdonnells from Frank McAllister Park. Completed at one of our sessions in 2013. So please consider joining us for some art and a social. 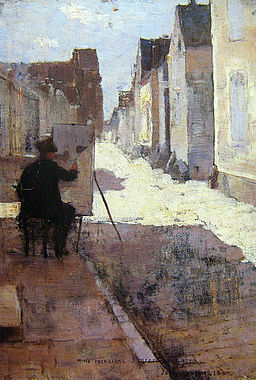 Full season’s program under the ‘Plein Air’ TAG above. Brief details available under the ‘Calendar’ TAG. Consider joining us this Sunday at 3PM at the Totem Theatre. Meet 3PM in the Totem Theatre car park on the Todd riverbank (beside Anzac Oval – access off the Anzac Oval carpark). 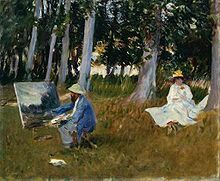 As usual bring your art supplies, a chair, water, hat and some nibbles for our social meet afterwards. Time is running out for outdoor art so avail of the second last session for the Winter season. Join us on Ilparpa Rd at the turn-off (T/O) to the Archery Complex at 3pm. We will wait till 3:15pm. If you are a little late you will get a second and final chance at 3:30pm when Mark will return to the T/O a final time. You might try and phone Dugald 0409 174 719 or Mark 0428 478 143 before you leave town or en-site if you have signal coverage. 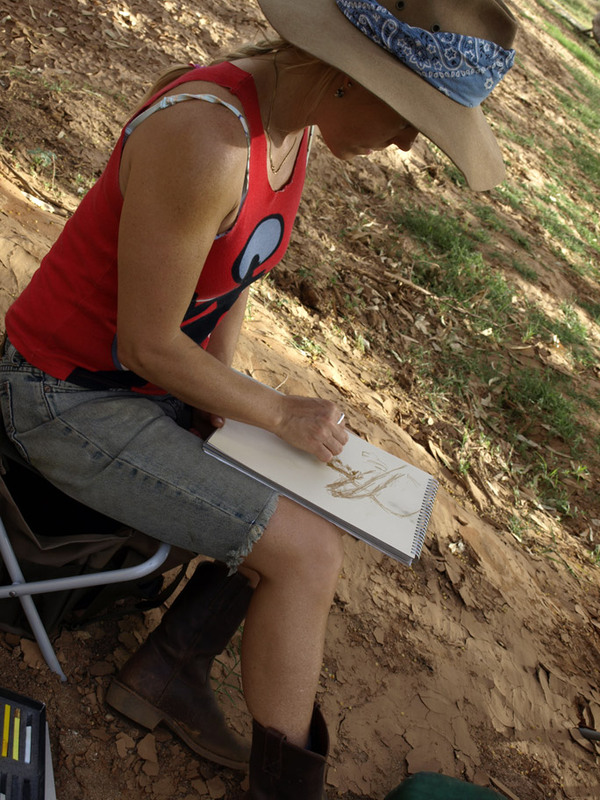 Remember your water, hat, appropriate seating for your needs along with your art materials. Toward sunset we will get together for a chat and some afternoon tea if you care to bring something along. Remember some vino if interested. We look forward to you joining us in the Great Outdoor Studio.